Members of the public view the casket containing former President George H.W. 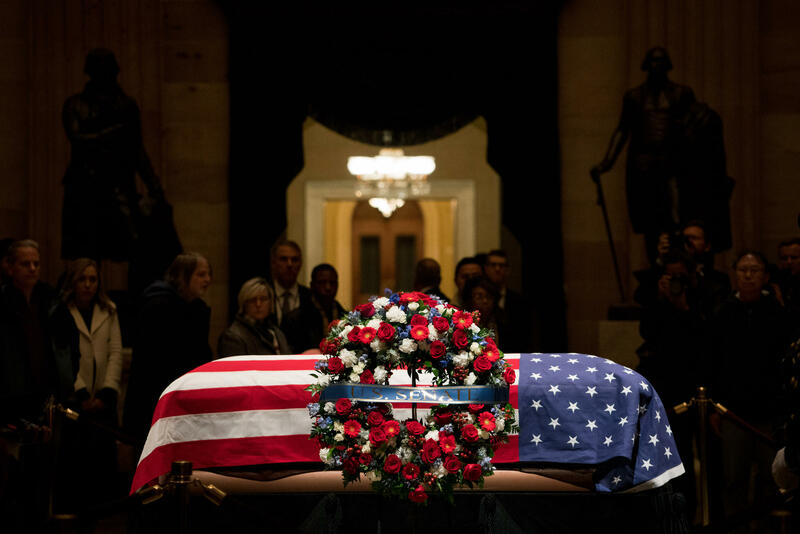 Bush's remains as he lies in state in the U.S. Capitol Rotunda on Monday night. 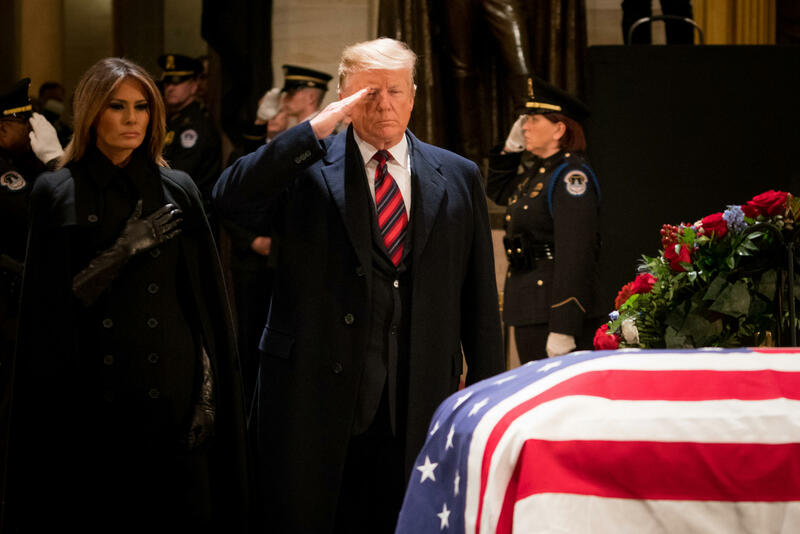 President Trump gave Bush, a decorated WWII naval aviator who flew several combat missions, a brief salute before the first couple left the Capitol. 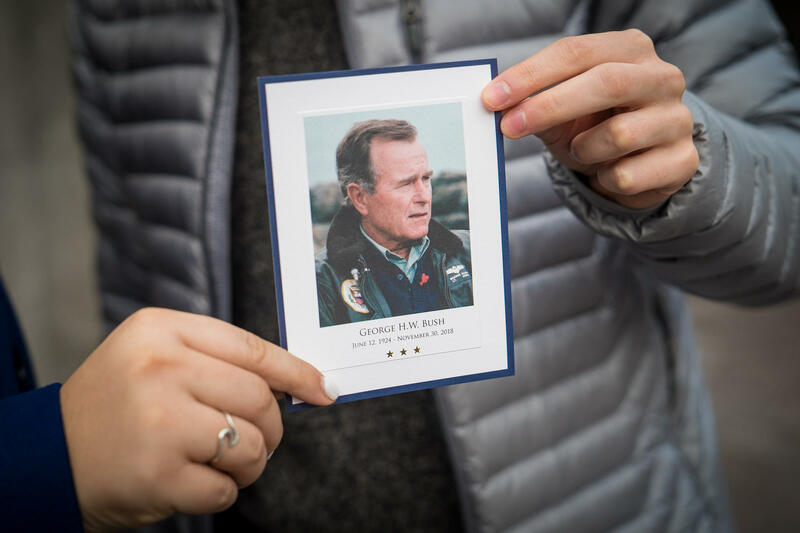 Grace Rector and Yuri Nesen, both sophomores at Georgetown University, hold up a card commemorating former President George H.W. Bush after visiting the Capitol. 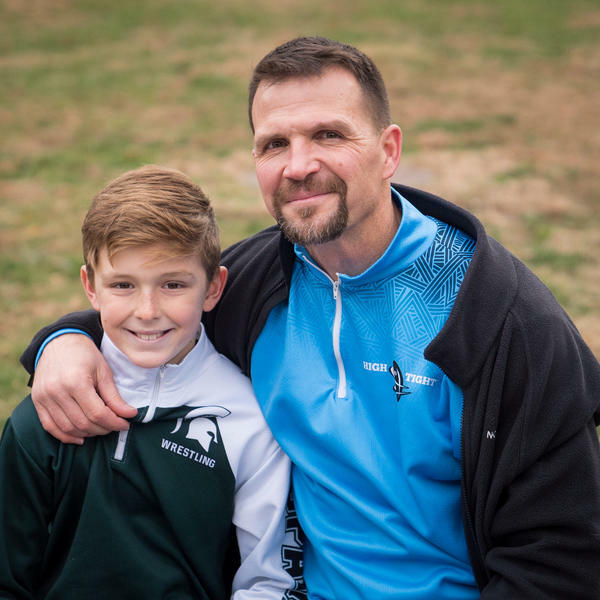 Tom Creguer sits with his 10-year-old son Xavier. "Today's politicians could learn a lot from his legacy," Creguer says. 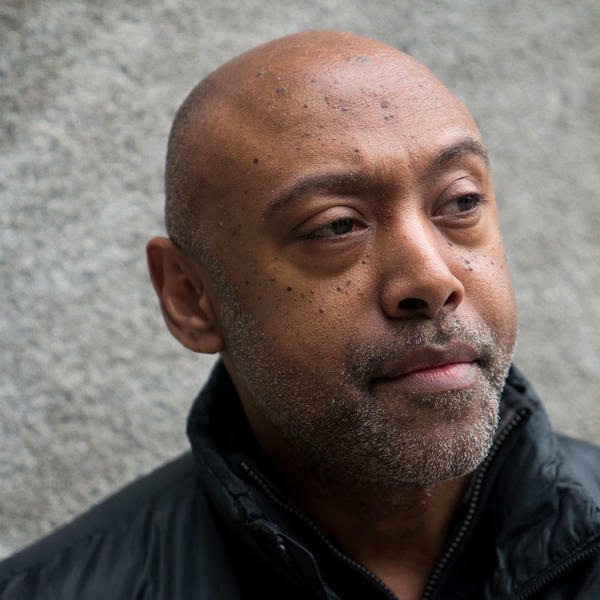 "He [didn't] lower himself to the clamor that exists." Former Florida Gov. 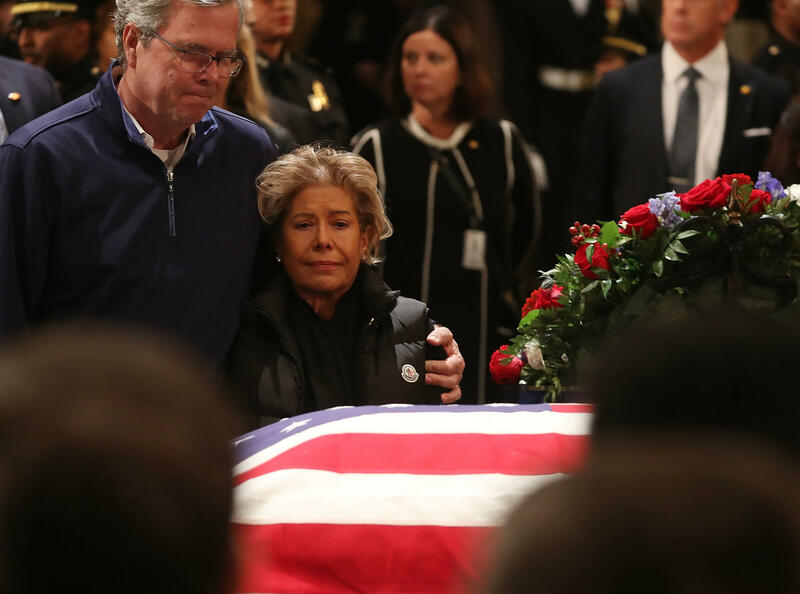 Jeb Bush and his wife Columba Bush pay their respects in front of the casket of the late former President George H.W. Bush as he lies in state in the U.S. Capitol Rotunda Tuesday in Washington, D.C.
An American flag flies at half staff in front of the U.S. Capitol building. 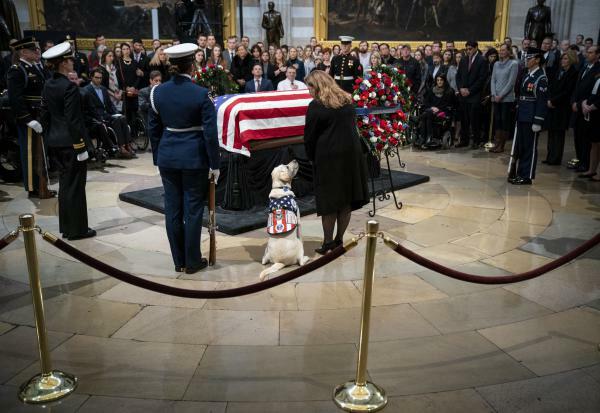 Sully, a yellow Labrador service dog that belonged to former President George H. W. Bush, sits near the casket of the late president as he lies in state at the U.S. Capitol, Tuesday in Washington, D.C.
Former U.S. President George W. Bush and his wife Laura Bush pay their respects in front of the casket of the late former President George H.W. 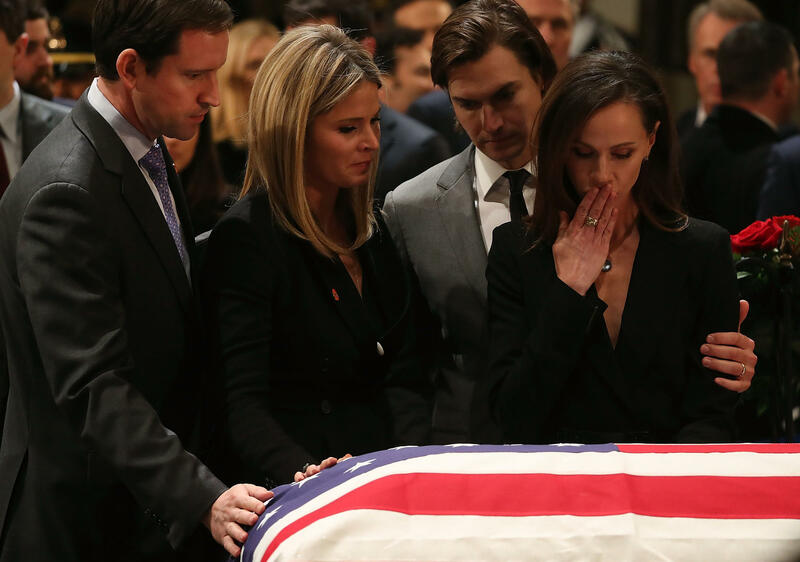 Bush as he lies in state in the U.S. Capitol Rotunda, Tuesday in Washington, D.C.
Jenna Bush Hager and her sister Barbara Bush stand with the husbands Henry Chase Hager, left, and Craig Coyne as they pay respect in front of the casket of the late former President George H.W. 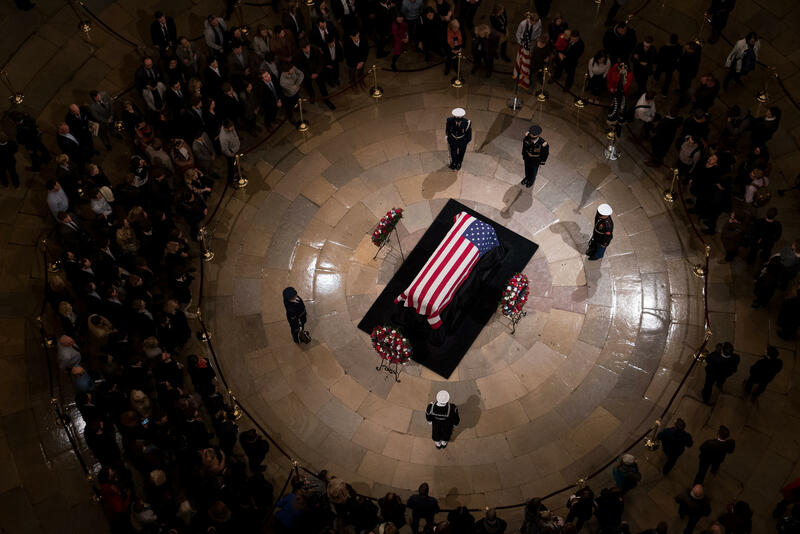 Bush as he lies in state in the U.S. Capitol Rotunda Tuesday in Washington, D.C.
DeForest Mapp didn't vote for former President George H.W. Bush, but he respected his temperament and poise. "It's a throwback, but it's a very, very welcome throwback," Mapp says. 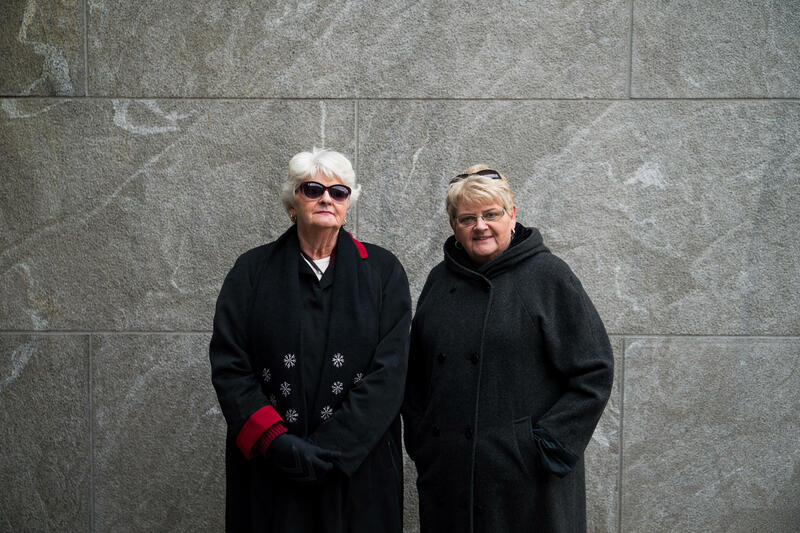 Suellen Wheatley-Wilkins, right, with her sister Deborah, are longtime admirers of the former President. "He just set such a standard for the entire country," Suellen said. "He loved his country and he respected the people." Bush was eulogized during a Capitol ceremony by Senate Majority Leader Mitch McConnell, who called him "a humble servant who loved his fellow citizens." A military honor guard waits to stand watch over the former president's remains. 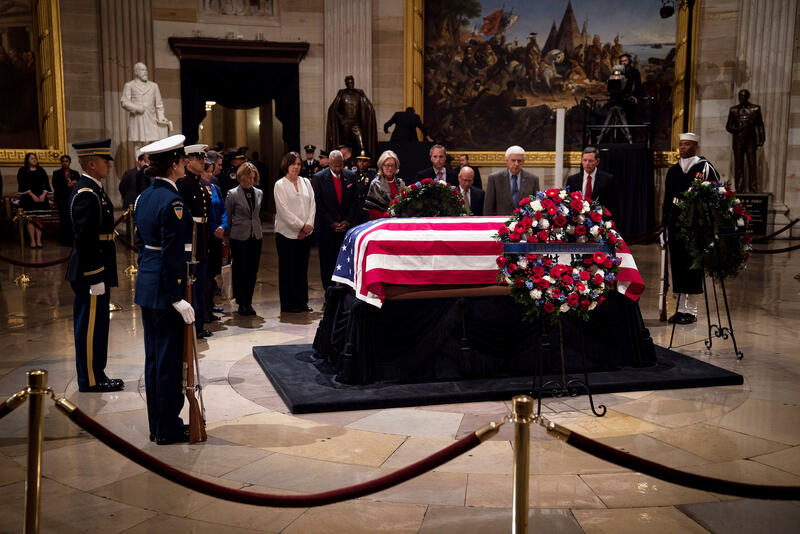 Bush is the first president to lie in state since Gerald Ford, who died in 2006. 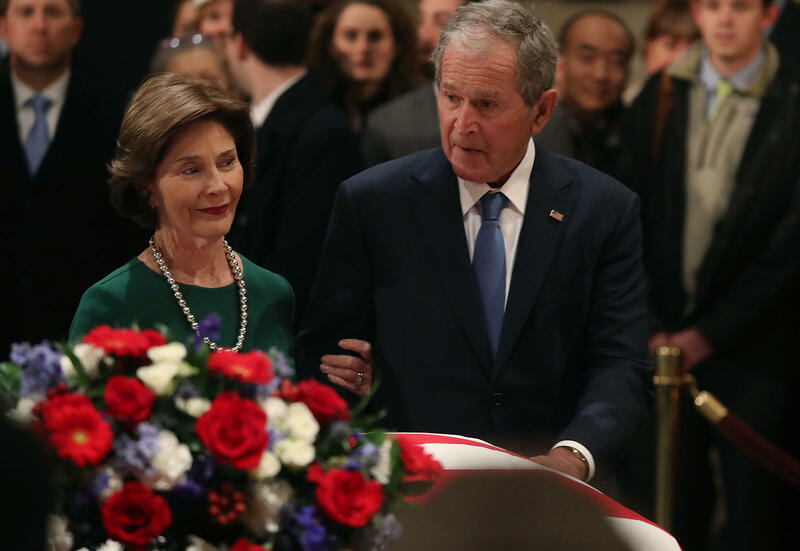 Following the funeral in Washington on Wednesday, Bush's casket will be returned to Houston, where a private service is scheduled for Thursday. Former President George W. Bush, the late president's firstborn child and eldest son, former first lady Laura Bush, their twin daughters Jenna Bush Hager and Barbara Bush, former Florida Gov. 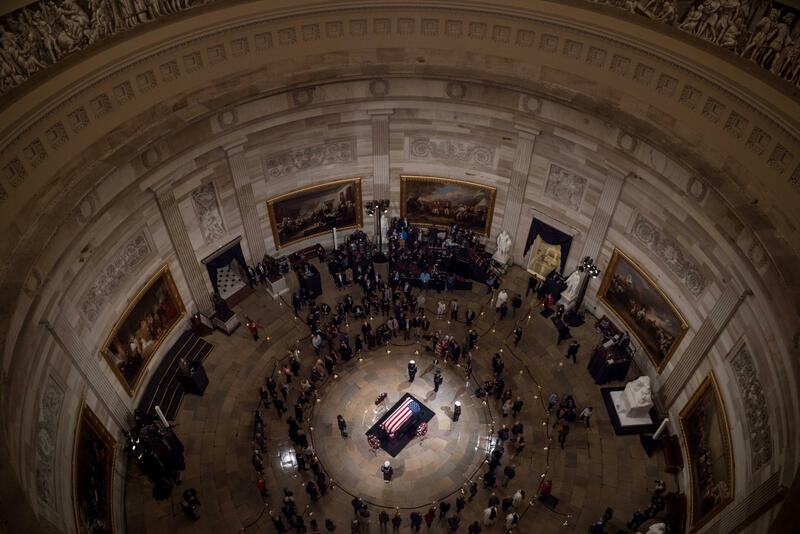 Jeb Bush and several other members of the Bush family paid their respects to the family's patriarch in a visit to the Capitol Rotunda Tuesday evening. Some of the mourners came by themselves. 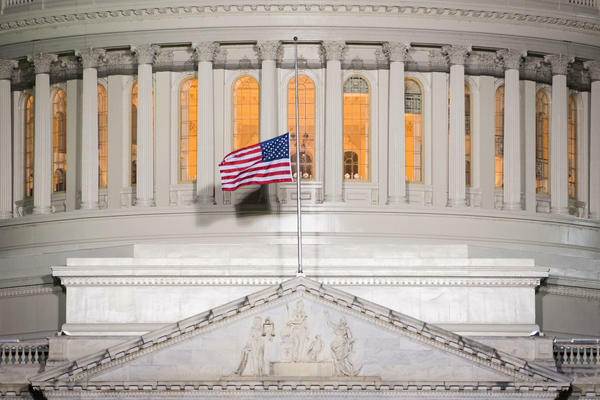 Seventy-five-year-old retired government worker John Fawcett of Washington came because "I just want to say goodbye." He called Bush "a fantastic leader," adding "I have the greatest respect for him." Among some of the who paid their respects, there was a sense of longing for the "kinder, gentler" nation that Bush spoke of during his inaugural address. DeForest Mapp, a freelance writer and producer from Portsmouth, Va., said Bush governed with poise and and charm. "He was a president with conviction," Mapp said, and added that "right now the country is in dire need of someone in leadership that has the right temperament for that position." Thirty-five-year old Katie Perez came along with her husband and two young children. "I really appreciated the way he led the country with such grace, and I think we need more of that nowadays among all politicians. It was kind of the end of an era in that sense," Perez said. Tom Creguer drove overnight from Michigan to pay his respects. A Gulf War veteran, Creguer said Bush "set out to make a difference, and he did that until his last breath." Creguer added "I think that's what we as Americans need to do, in our hometowns, in our back yards and across the world." Suellen Wheatley-Wilkins, a 66-year-old retiree from Delaware, said she saw the late President Bush and his wife Barbara "as the parents of my generation." He just set such a standard for the entire country," she added. 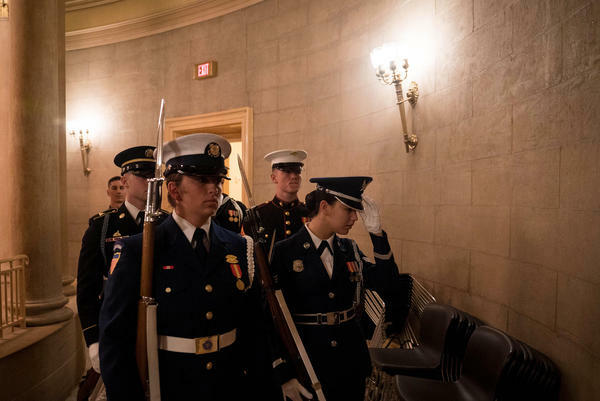 Among the many dignitaries paying their respects Tuesday was former senator and onetime political foe Bob Dole, who like Bush served and narrowly avoided death in World War II. Dole, 95, was assisted from his wheelchair to stand and snap off a salute to his fellow member of the "greatest generation." Tuesday afternoon, Jeb acknowledged Dole's touching gesture, tweeting "Just incredible. Thank you Senator Dole." The country's 41st president was eulogized Monday night by Republican congressional leaders and Vice President Pence, who said Bush "never lost his love of adventure and he never failed to answer the call to serve his country." President Trump and first lady Melania Trump stopped by later Monday evening to pay their tributes. Trump also tweeted Tuesday that he will meet with "the wonderful Bush family" at Blair House, where they are staying, across Pennsylvania Avenue from the White House. He also said that former first lady Laura Bush will be given a tour of the White House Christmas decorations by Melania Trump. "The elegance & precision of the last two days have been remarkable!," Trump also tweeted about the events so far to honor the late president. Around the time of Trump's tweet Tuesday morning, a spokesman for the office of the 41st president tweeted thanks to Trump and the first lady and others in official Washington "for their amazing support as we attempt to give this great and good man the send-off he surely deserves." Trump has had a frosty relationship with the Bush family. He called his 2016 GOP primary opponent Jeb Bush "low energy," criticized the leadership of President George W. Bush and recently mocked the elder Bush's "thousand points of light" volunteer program. Bush will lie in state in the Capitol Rotunda until Wednesday morning, when his casket will be transported to the Washington National Cathedral for a state funeral. Those giving eulogies at the service there include former President George W. Bush, former Sen. Alan Simpson, former Canadian Prime Minister Brian Mulroney and Bush biographer Jon Meacham.